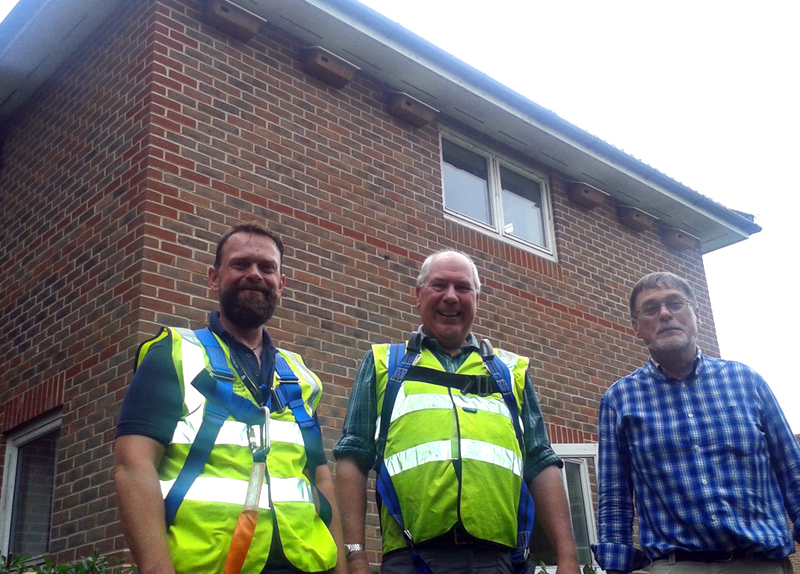 Writtle University College has installed six new Swift nest boxes on a building to encourage the threatened birds to breed. The Swift boxes – which are elongated in shape with an oval hole - have been installed on one of the University College’s office buildings. WUC’s Property staff used a cherry picker to install the boxes high up on the office building, which was chosen as it has quite an open situation and gives the birds a ‘runway’ to come in on. Inside one of the boxes is a loudspeaker which emits Swift noises at dawn and dusk during Spring and Summer to help attract the birds in. Swift Conservation provided the boxes and the technical know-how, while Essex Birdwatching Society funded their purchase. Members of Writtle University College, Essex Birdwatching Society and Swift Conservation below the newly-installed boxes.